Greenwood – Definition: A forest in foliage, a wood or forest when green. The inception of Greenwood occurred sometime in 1968 when leader Robin Kimura was in the 5th grade. Back then, the closest thing to a real band was a lip-sync entity called “Wolf-Pack”. 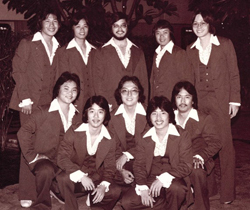 In 1972 the real band got together as Robin Kimura and classmate Bradley Choi, both 9th graders at Kaimuki Intermediate (Middle) School, began recruiting the players that would make up the original Greenwood band. The name Greenwood was derived from “Greenway”. Since Greenway had no real meaning, it changed to Greenwood when a friend recommended the name based on its definition. At the time, the ecology movement was “in” and the name sounded “fresh” so the decision was easy. From the start, Greenwood was designed to be a brass-oriented band. At the time Chicago, Blood Sweat & Tears, Malo, and Mandrill amongst a growing number of recording acts utilizing horn sections, were the inspirational force behind Greenwood’s repertoire. 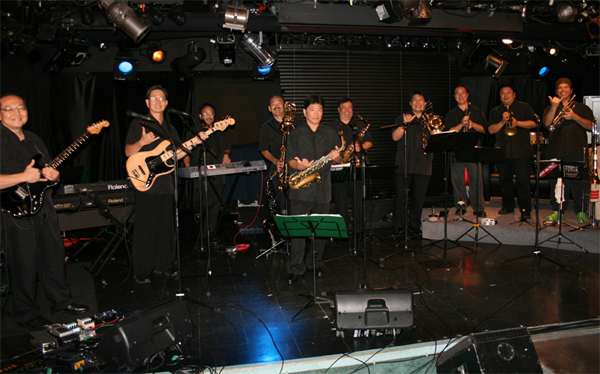 Thus, their sound was a Latin-Rock sound accented with brass. The brass sound and look remained throughout Greenwood’s nine-year run as a dance band. As all bands did in “those days”, high school dances were the gig of choice for an up and coming band and a stepping-stone to the nightclub scene. Their first gig was at a local YMCA for a social party gathering. The nine players shared a $15.00 check. 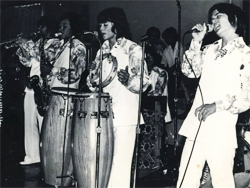 However by their third gig, Greenwood was featured with three of Hawaii’s top bands and became apart of a team of opening acts for El Chicano who motored into town for a Christmas bash in December of 1972. That set the stage and gave them momentum as they eventually became popular in the high school dance circuit and progressed onto the nightclub scene. 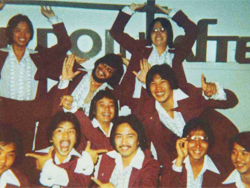 With a stepping stone intro to the nightclub scene at the Magic Mushroom, Greenwood made their mark in Waikiki by being the premiere off-night band with a full time schedule. At the height of their run, their weekly schedule looked something like this. Sunday’s at the C’est Ci Bon, Monday’s at the Hula Hut, Tuesday’s at the Tiki Wednesday’s at the Waikiki Beef N’ Grog with Friday and Saturday’s gigging on Kauai or Maui. At one point a local publication Sun Bums and its writer John Berger, appropriately named Greenwood “army on the move” due to their green uniforms, the nine-man lineup and rigorous schedule night after night. Greenwood also found success on the neighbor islands of Kauai and Maui. At one point they were touted as Kauai’s favorite band with monthly gigs at the Kauai Resort showroom. They then moved on to Maui and played at Kauai Resort’s sister hotel the Maui Beach and broke attendance records there. Playing on the neighbor islands through several successful New Year’s Eve celebrations, both hotels began vying for Greenwood to play on conflicting weekends. Maui eventually won out as Greenwood felt a need for a change in venue.